GnuPG, the highly regarded Open Source email encryption software, used phpList to launch a successful campaign. Today, GnuPG finished the first stage of a high profile crowd funding campaign. They used phpList as a key part of their marketing strategy. 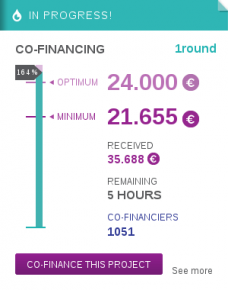 The campaign made 100% of the target amount within a whirlwind 26 hours, and has achieved 164% of their goal on completion, giving them over €35,000 in total. I interviewed Sam Tuke, the GnuPg campaign manager to find out about the role phpList played in the campaign. Anna: Why did you choose phpList for the GnuPG campaign? Sam: Because it’s Free Software and we can host it ourselves. I’ve been a phpList user since 2008, and over time I’ve installed it for a variety of organisations and companies operating in different markets. As far as I know it’s still the only competitive Free Software application for mass mailing. Besides that, it works reliably, and once templates are configured, it’s easy to use. I’ve helped non-technical people to use it in the past and some of them have now been using it for years without any assistance. That means it will be easier for other GnuPG team members to send mails to our supporters in future if necessary. And of course, being web-based means it’s accessible anywhere with internet access. Anna: Which phpList features did you use for your campaign? Sam: One of the most useful features was the embeddable self-signup form. I added this to the end of a couple of posts on the GnuPG blog encouraging readers to sign up, and over time the number of list subscribers grew as people registered. I really like the simplicity of the form too. It’s AJAX and provides instant feedback to users without requiring them to leave the page, meaning they never leave our blog in the processes of registering to receive emails. Anna: did you use phpList hosted or did you host it yourself? Sam: For GnuPG I actually used the hosted option. Although I have run my own phpList installations in the past, I needed the system up and running fast, so having access to a hosted instance was really convenient. Anna: What role did phpList play in your campaign strategy? Sam: News about the campaign was spread in multiple mediums – the blog, Twitter, mailing lists, etc. Of those, phpList subscribers were the highest priority group; these were people with a keen interest who were early readers of our blog posts, and who I expected to be the most keen and proactive to spread our news. So I tried to give our mailing list subscribers special treatment with news first and a more friendly and familiar tone than our other communications. We had a few journalists on there, for instance. So phpList had the role of communicating directly with our most important supporters. Social media broadcasting is too impersonal for that, and phone calls and personalised messages too time consuming. PhpList provided just what I needed for the job. Anna: How do you plan to use phpList in future? Sam: The Christmas campaign was the first step of a new plan for sustaining GnuPG in future. The money we raised will be enough to release the next major version of the software, and launch a new modern project website. That will include the ability to manage recurring donations, also known as subscriptions. Ultimately, we want to fund GnuPG through small regular donations from a wide base or supporters. Getting to that point will take work not only on infrastructure and development, but also with GnuPG’s public image and brand. Mass emails and phpList will be a key component of our future communication strategy – I want more lists of grouped subscribers and more members belonging to those lists. Sam: Separate to my work at GnuPG I’m also Campaign Manager at the Free Software Foundation Europe, and there we use CiviCRM (on top of Drupal), which also has mass mailing features. I like CiviCRM a lot, and especially the community surrounding it. However I find the mailing features more clunky to use. I much prefer the phpList interface – it’s quicker to use and easier to learn. I haven’t used MailChimp or other proprietary mailers, but I know they have neat features that phpList would benefit from. Pre-made Creative Commons HTML mail templates would be useful, as would a more mobile friendly web interface and most importantly automatic “view message as web page” functionality. If you would like to get involved with phpList development to make idea’s like this a reality then why not join the phpList development team? Finally, we are delighted to announce that phpList Hosted can now be used free of charge by software projects such as GnuPG. Please get in touch to learn more. With Love from Anna – the phpList Community Manager.